A group of five women venture into the bushland outside of Melbourne for a corporate retreat. Three days later, only four of them return. One woman, Alice Russell, has disappeared. But did she leave of her own volition, or did she encounter some danger in the Australian forest? Federal Police Agent Aaron Falk is deeply invested in finding Alice, as she has important information regarding an ongoing investigation. However, he finds that each of the other four woman on the retreat have a different story to tell about their time in the wilderness. I have a strange love/hate relationship with detective novels. Too often they are predictable and filled with cliched characters that operate as cardboard cutouts. Readers can expect a surly detective with a grim past. If his partner happens to be a woman, there’s an unspoken quasi- romantic connection between two of them. All the supporting characters speak from a script that seems designed to throw up red herrings. And yet, there are times when these basic tropes can either be turned on their heads, or given new life through deft writing that can make this somewhat tired and overused genre feel fresh again. 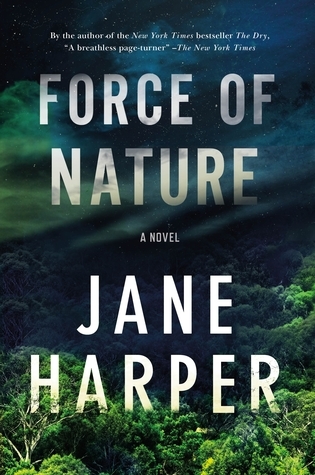 Jane Harper’s second novel, Force of Nature, is definitely in the latter category. I’ll keep this review short and sweet as to avoid any spoilers. Part of the narrative is devoted to Detective Falk and his partner as they join in the search for the missing Alice Russell. Interspersed are chapters from the perspectives of each of the four other women in the wilderness retreat as they go through the events leading up to Alice’s disappearance. I found the chapters from the women’s perspective to be more entertaining; they are all so comically unsuited to the outdoors and so utterly incompatible with one other it almost feels like a reality prank television show. After they venture off course and become increasingly lost and frightened, we can see how their conflicting personalities combined with a survival situation could have resulted in violence. Novels like these are a guilty pleasure of mine. They do not necessarily enrich the mind in any particular way. I didn’t really learn anything from Force of Nature that caused me ponder its plot or themes in the days after reading it. However, it was a highly enjoyable diversion that kept me guessing from start to finish. Which is exactly what I was looking for at the time. You can find Force of Nature here on Amazon or here on Book Depository.